Choose from 3, 6, or 12-month Clubs and look forward to monthly deliveries of the finest premium cuts from Stock Yards. The Stock Yards® Club is the gift that gives all year round. 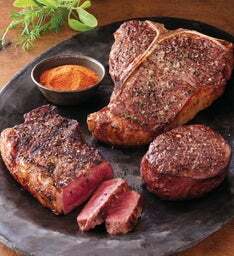 A new entrée delivered to your door saves you a trip to store, each month you will receive a full order of premium Stock Yards® steaks or chops, a whole roast, racks of ribs, or other exceptional cuts, including USDA Prime and USDA Choice specialties. This club allows you to cook up the main course for your family meals, or main event for a special occasions during grilling season, and each monthly gift is packaged with care and arrives ready to cook and serve. 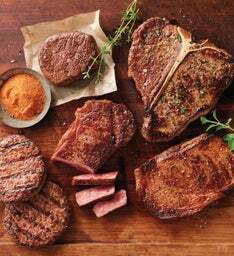 The steakhouse club is the ultimate gift for the carnivore in your life. And even if that carnivore is you, a new entrée delivered to your door saves you a trip to store. Each month you will receive a full order of premium Stock Yards® steaks or chops, a whole roast, racks of ribs, or other exceptional cuts. Ideal as the main course for your family meals, or as the main event for a special occasion, each monthly gift is packaged with care and arrives ready to cook and serve. The Steak and Wine club delivers expertly paired Stock Yards® entrees and exquisite Harry & David wine. 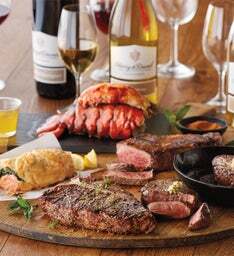 Enjoy such combinations as our crowd-pleasing Kings and Queens Collection accompanied by Pinot Noir, succulent lobster tails paired with Chardonnay, and much more. Eat well every month with incredible Stock Yards® Clubs. Simply choose which Club you want—our classic Stock Yards® Club or our Steakhouse Club—and customize from there. Whether you choose the 3-, 6-, or 12-month Club, you’re sure to enjoy the incredible selections that are brought right to your doorstep. Each shipment contains ample portions of that month’s featured product, so there’s plenty to share with someone special or even enough to feed the whole family. Our entrées—in addition to our sides, appetizers, and desserts—are perfect for special occasions, outdoor grilling, or any-night-of-the-week dinners. The party never ends with Stock Yards® Clubs. Enjoy premium, steakhouse-quality selections of our finest offerings, like USDA-certified Steak Burgers, mouthwatering boneless rib eye, succulent lamb, hearty New York strip steak, and so much more. Our incredible steak-of-the-month clubs make wonderful gifts for friends and family, or treat yourself to these selections of fine Stock Yards® entrées. Stock Yards already has a reputation for offering the finest steaks, chops, seafood, and more, and joining a meat-of-the-month club ensures that you have top-quality entrées brought straight to your doorstep month after month. Delivery makes it easy to just place your order and kick back—we’ll take care of the rest.